As a destination for chocolate lovers, Amsterdam is sadly underrated, passed over in favor of nearby chocolate capitals like Brussels and Paris. But nestled in some of these old canal houses are some of the best artisanal chocolatiers on the continent. And that's not all: With an annual chocolate festival, Chocoa, and the Cacaomuseum, Amsterdam is destined to become a hot spot for chocolate fanatics. But the proof is in the product: Drop into one of these favorite chocolatiers for a taste of one of Amsterdam's lesser-known specialties. Who doesn't love Puccini Bomboni? 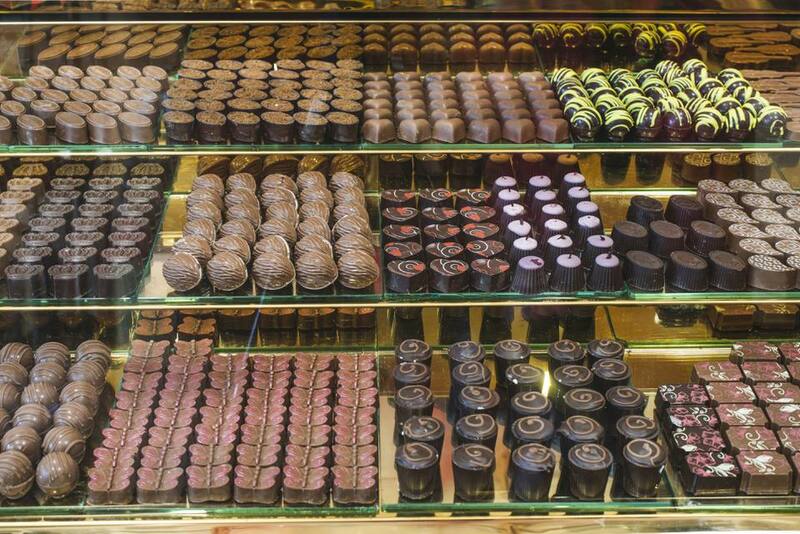 Amsterdam's most celebrated chocolaterie is the place to start on a chocolate tour of the Dutch capital. Puccini Bomboni's trademark oversized bonbons are spiked with flavors from French spirits and liqueurs to fruit, nuts, and Southeast Asian spices. Cream and pure, milk, white, or dark chocolate are the central ingredients of every Puccini Bomboni bonbon and form the simple basis for an explosion of variety via additions like figs, ginger, cognac, coffee, cranberry, pecans, and Cointreau, just to name a few combos. Shape and appearance count, too, and every type has its own signature look. ArtiChoc is all about purity and avoids sugar as much as possible. That's quite an accomplishment for a chocolate-maker. ArtiChoc takes the diversity of flavors to the next level, with bonbons such as a caramel-pine nut, pimiento, honey-whiskey, marsala, and basil. Seasonal specialties, like chocolate "chestnuts,", "acorns," "mushrooms," and "pumpkins" for fall, keep the assortment timely. Pompadour is hailed for both its chocolates and pastries, the latter of which are served—in addition to breakfast and lunch—in an authentic Louis XVI tearoom, with interior flourishes imported from Antwerp, Belgium. Die-hard sweet tooths can relax with a tea and pastry and then take some chocolate for the road. Pompadour's chocolate is the renowned French Valrhona, and it creates its recipes with its Belgian and French chocolatier colleagues. What a pedigree. Vanroselen's chocolates are handmade and mix the flavor of cocoa with herbs and fruit for subtle chocolate taste treats. Vanroselen also sells top-quality brands of chocolate made in small batches from all over the world, so this is your chance to sample these hard-to-find pieces of heaven. At Amsterdam's Chocoa Festival, you'll learn about the process of making chocolate, from its beginnings as a cocoa bean to that delicious bonbon that sends you over the moon. Some of the most renowned chocolatiers in the world will enlighten you about how this most adored candy is made as you engage in to-die-for chocolate tastings of their chocolates and pastries and learn about pairings with food and wine. The Cacaomuseum tells you everything you ever wanted to know about chocolate, and, of course, it has examples for sale. You can choose from 100 different kinds of chocolate bars from all over the world, along with such unusual items as chocolate cheese, cacao sausages, and chocolate vinegar. The museum even has paintings made of, yes, chocolate.